Doxi the Dog in Ambienceworld is free to download on the Amazon Kindle this weekend. 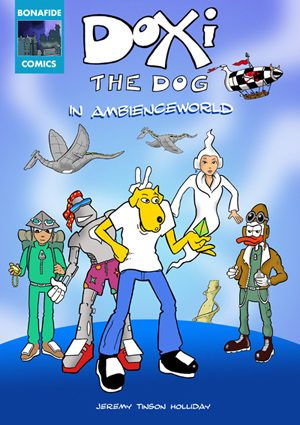 The complete collected adventure of Doxi the Dog in Ambienceworld. Doxi is reluctantly enlisted to help Huloo, a disciple to the Guru of Ambienceworld, where the storm clouds of war are gathering. He must help the Guru restore peace and encounters many friends and enemies on the way such as his new co-pilot in adventure and danger, Skuttler the Duck as well as the Pyranoids, Dancenoids and Moutheads. There are plenty of twists and turns as Doxi also encounters the dastardly Zep-Pirates, the surreal Fortress of Lost Dreams and his own alter ego. Full Color comic strip adventure story.